As parents, we all really want the very best for our precious little babies so we can give them the best start in life. Deciding which baby sneakers (or baby trainers, for our UK friends) to buy our children is not something we should overlook, as the shoes must be comfortable for the baby and protect their feet well, and a pair of ill-fitting or badly made shoes can cause problems for their foot growth and development. 2 Why Buy Baby Sneakers? These great little shoes are made of high quality cotton to ensure that they are soft, flexible and very breathable for your little ones precious feet. They have rubber soles, which will give protection and flexibility, and have non-slip so that they will be good for children who are learning to walk for the first time. These shoes also come in a range of different designs and colors, meaning that they make infant girl shoes or baby boys shoes. Your child will just love wearing these 100% soft friendly breathable Canvas shoes. The outer sole is well-crafted of durable rubber to better protect your kids from slipping, and the Midsole is made of super soft elastic material, so these are soft, comfortable, and they won’t fall off your baby’s feet. These lightweight material enable you kids to enjoy themselves and feels no any burden on their feet. What we really love about these shoes is that they come in lots of different cute designs for you to choose from, including baby sandals, baby booties, baby loafers and more. And with velcro patches they are easy to get on and off. Not only will your child look amazing in these, their feet will feel amazing too. What’s more, these Soft, breathable shoes are flexible to support natural foot movement, easy to slip on and off, and have hidden elastic to ensure that they don’t fall off baby’s fee. If you are looking for both style and comfort for your child, get them a pair of these. Looking for a great set of everyday shoes for your little babe? Want to have a choice of colors so that they can match their favorite outfits? Well these might be what you are looking for. 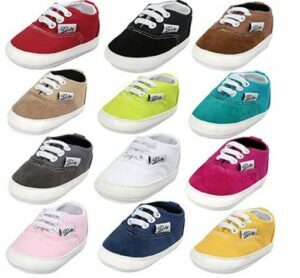 Luvable Friends basic canvas sneakers are a great complement for your baby’s outfit. 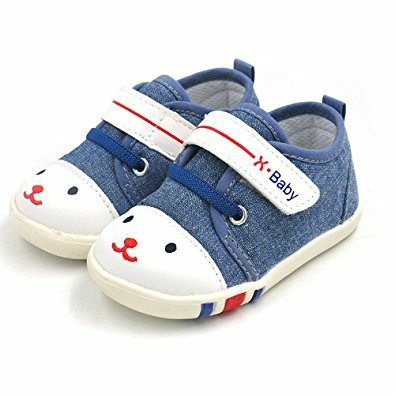 Made of durable materials with non-skid soles, these baby shoes come a small tab on back so you can out them on and take them off very easily. They are very comfortable and soft for pre walkers, and they have great non-skid soles for extra support to those tots who are just starting to take their first steps. With pink, gold and black designs, these cool babies boots are great newborn shoes for boys and girls! 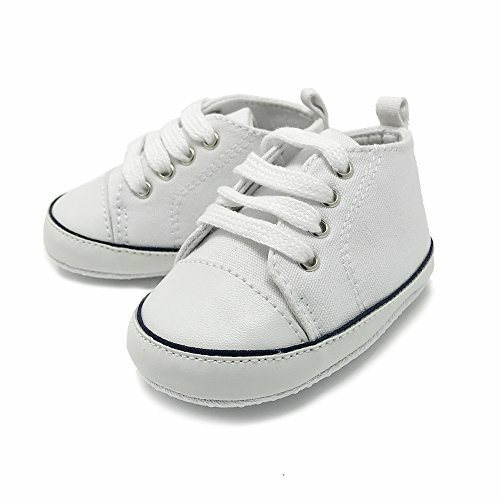 These canvas sneakers are soft and breathable, and they have anti-slip soft soles to give your child more grip when they start to walk. These are especially designed to be warm and to slip off and on with ease, so they make great everyday baby shoes and are especially good in the winter for keeping baby’s feet toasty and cozy. 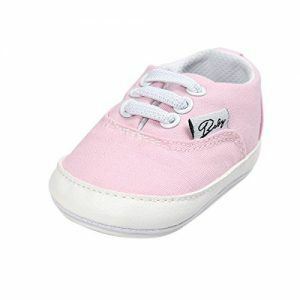 These cool lace up sneakers are soft and lightweight, perfect for delicate little baby feet. They have some really cute designs that your baby will look super stylish in, and although the shoes are easy to get on an off, they have reinforced elastic to make sure they fit securely and won’t fall off as your baby is playing. They also have soft anti-slip soles to keep your baby safe and secure. Do you have a little toddler who is crawling around or starting to walk? These adorable shoes are designed with that age group in mind, and with these high quality and lightweight kicks, your baby will be walking in double time before you know it! You may be interested to know that the manufacturer, Frills du Jour, is a business owned and managed by women to provide sleek yet accessible and affordable styles for mothers. Frills Du Jour’s mission is to empower mothers and daughters. Looking for something stylish yet comfortable for your little princess? These are made from super breathable and comfortable mesh fabric, so little feel will feel comfortable and airy as they wear them, and you don’t have to worry about them getting too hot. They have Velcro straps for easy taking on and off, and a great non-slip sole for new walkers. Please be aware that this manufacturer has their own size guide that you should check out before buying. 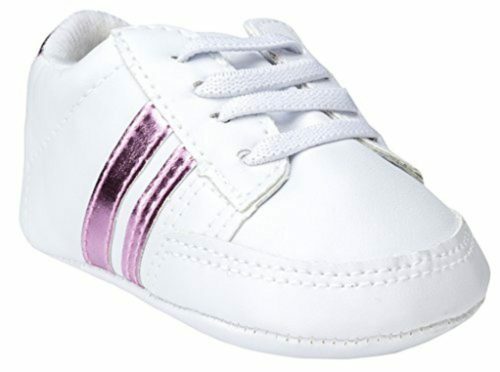 These cool stripe sneakers are a great complement for your baby’s outfit. Made of durable materials and with practical non skid soles, these baby shoes are easy to slip on and off baby’s foot. Elastic laces secure the shoe. 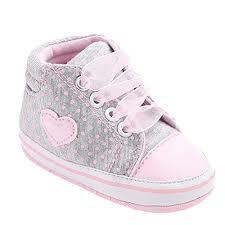 Available in sizes up to 18 months, so they are good baby and toddler sneakers. 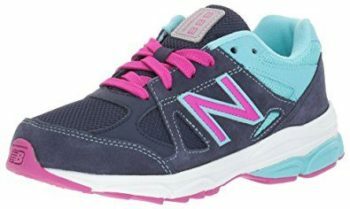 New Balance make some of the best sports and training shoes in the world, so if you’ve got a scrappy and energetic little one, a pair of these might be a good match for them. These are made of a combination of mesh and leather, so they are super breathable and very comfortable for the baby’s delicate feet, plus the strong sole which will protect their feet but is still flexible enough not to restrict their movement or growth. There are also options for plenty of cool colors, from blacks and greys to pinks and purples, so you can find a great pair for a boy or a girl. These awesome sneakers take the famous three stripes of Adidas to your babies tennis style shoes. They are made from suede, so they are nice, soft and breathable for your baby’s feet, and they will feel warm and comfortable. They also have a nice big chunky rubber sole to protect your babies feet, and a removable insole. The straps also give a snug, comfy fit. Available in a number of different sizes, for newborns and for toddlers. Adidas make great sneakers, so why not get your little one started on a pair? 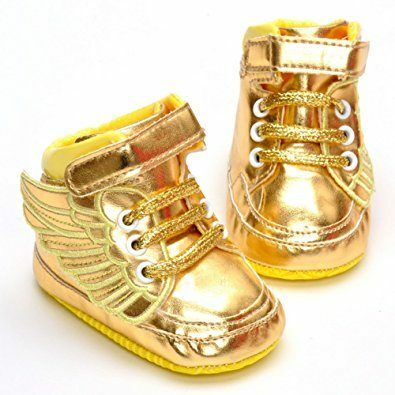 Just check out these stunning gold baby kicks? If your baby girl is already turning into a little glamour queen, these might just be the best sneakers for her. These cool baby booties , and have been safety tested to give parents peace of mind. 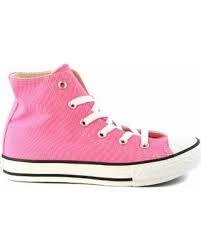 They are lined with cotton and have soft soles with elastic to help keep them on your little girls feet. They are soft, lightweight and have anti slip on the soles, so not only are they incredibly stylish, they are very practical too. These gold shoes make great baby shower gifts as well! Looking for a great set of shoes on a budget? These Canvas baby shoes definitely won’t break the bank, but you won’t be skimping out on quality either. They have an elastic ankle band to make these baby moccasins well fitting and easy to take on and off, and a great anti-slip rubber sole to make walking feel natural for the young ones. These have also been safety tested, so they won’t cause rashes or anything like that to your child’s delicate skin. Timberland boots have a reputation for being very high quality, and we’re glad to say that their infant shoes are also just as good. 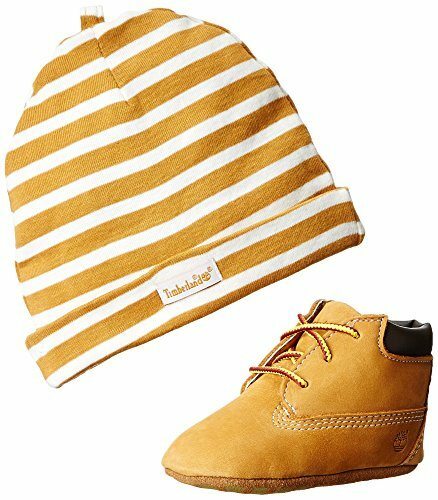 Made of wonderful Nubuck Leather and with a strong leather sole, these great baby booties are very durable and warm, yet still breathable, and the terry cloth inside lining will keep your children’s feet snug and comfortable. It comes with a super cute matching hat, too. These are available in lots of different colors. This set also comes in a gift box, making these crib shoes wonderful gifts for new parents or baby showers. If mum or dad is a big fan of the iconic Chuck Taylor Converse brand, then why not treat your little one to a pair as well? Converse are some of the best made, most durable and most comfortable shoes on the market, and their shoes for newborns are no exception. They come in pink, black, red, grey, blue and while colors. These are made from warm and breathable canvas material, and have authentic rubber soles to protect baby’s feet and give them a grip when they are learning to walk. Rather than just a cash grab with the converse logo on them, these are serious high quality sneakers. 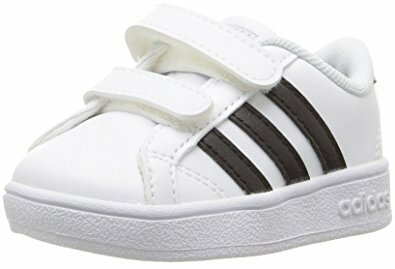 There’s no reason why babies shouldn’t have the same choice of classic shoe brands as adults, and these K Swiss baby tennis shoes prove it. Made of real leather and with a per-molded rubber sole, these are some of the most impressive baby shoes we’ve ever seen. These shoes not only look great, but they are comfortable, breathable, and your little one’s feet will be warm and cozy when wearing them. These are made of a combination of leather and textiles, so they are both breathable, comfortable and durable. They have Velcro straps so they are easy to put on and take off, and they’ll stay on your little ones feet no matter what mischief they get up to. 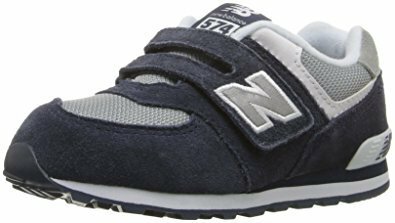 It has a nice chunky rubber sole with grips, perfect for protecting little feet and giving a bit of grip when they start walking. Overall, the quality and practicality of these shoes is just amazing, and they look really cool too. Available in black, blue and grey colors. 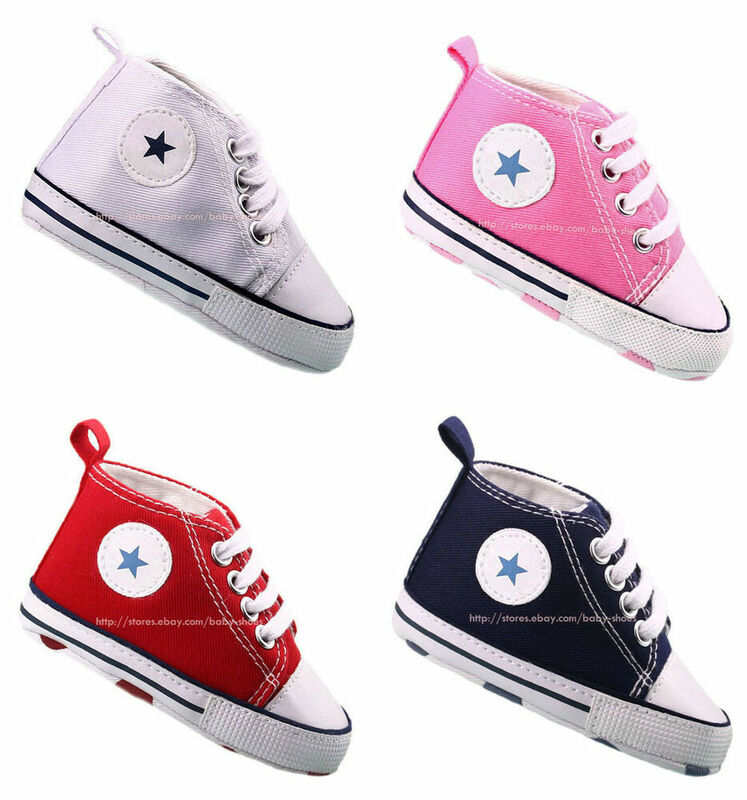 If you are looking to get the best baby sneaker you can buy in terms of quality, style and value for money, we recommend that you get the Converse All Star Infant Shoes. For purely shallow reasons, first of all we just love how amazing these look, and the different bring colors available really make them stand out and your kids will look super cool in them. But these shoes are ‘more than just a pretty face’ , if you will. The canvas fabric and textile materials are really breathable yet still sturdy, so they won’t fall apart anytime soon and your kids feet will stay nice and airy. They are very flexible too, so great for children crawling around and playing. Plus, the rubber sole is very high quality, and it has little grips to help with beginning to walk. Some parents might prefer Velcro or slip on shoes to the laces on the Converse, but personally we don’t mind tying their shoes and are happier knowing that they won’t fall off when we are out and about. All in all, these are great in terms of quality, practicality and style, and that’s why they are the top pick. 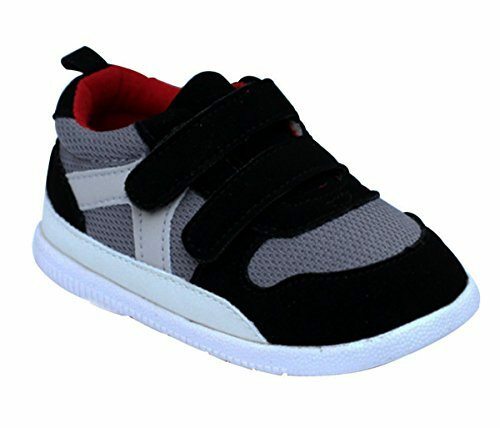 If you are on a bit of a budget, or maybe you just don;t want to splash out on something your kids will grow too big for very quickly, we recommend the Benhero Cavas Infant Sneakers. They may be super affordable, but they are still very good and well made shoes. Their canvas material is flexible and breathable, and they have great anti-slip soles to protect their feet and help give them a bit of a grip. SO your kids won’t be missing out on anything with these awesome sneakers. 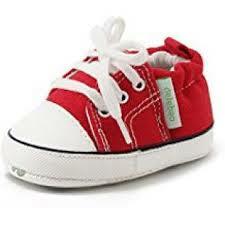 Baby sneakers are easily one of the most popular types of first shoes that most parents will get their child. They not only look cool, they are also very practical as the rubber soles are strong enough to protect the baby’s soft feet. 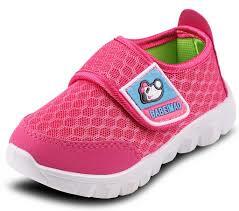 The interior of the shoes are often very soft and comfortable for the baby, and have nice warm lining. 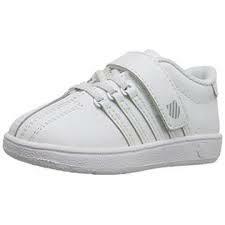 A lot of parents will also go with velcro sneakers, as these are easy to put on and take off. 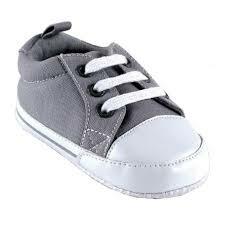 If the baby learns to take their velcro sneakers on or off, as my kid did and would have a habit of throwing them off when we were in the park, you could switch to lace baby sneakers, so you can avoid these embarrassing moments. As a responsible and loving parent, we’re sure that you know the need to get the very best for your baby. especially when it comes to shoes, as a bad pair of shoes could have horrible consequences on your child feet and their growth into healthy adults. Here’s a few things to look out for when buying. Flexibility – As you know, after about 6 months or so, most babies are desperate to explore the world around them. whether its the home or the park. they crawl, they roll, they slide, and they even start to take their first steps at some point. Therefore, they need soft and flexible shoes that won’t interfere with this. Worse still, shoes that are stiff and inflexible might be uncomfortable at best and hinder your child’s growth at worst, leaving them with foot problems for life. Breathability – just like you, your babe wants shoes that are breathable. They don’t want to have hot, sweaty feet, that can lead to itching, scratching and even rashes. Thats why we recommend getting shoes of cotton, leather, canvas or fabrics. Try to avoid plastic shoes if you can. Room to grow Kids grow at a phenomenal rate, so we need to strike the right balance between getting them something roomy enough for them to grow into but not getting them something so big it can’t stay on. Also, be aware that shoes which are too small can interfere with the child’s natural growth and cause a lot of problems. We recommend buying shoes that feel a little roomy, with space for the child to grow, but will also stay on without slipping off. The first thing to consider before buying shoes for babies are the size, age and stage of development. Support shoes are important and that’s why this table below highlights the right size of sneaker or shoes with the correct age, which will help you to search for and find the best trainer for your baby.